On the American frontier in the early 1800s, salt was four times more expensive than beef. Way back then—before a handy thing called a refrigerator came into existence—salt was essential for preserving food. Now, salt is so plentiful that we strew it on the streets to melt ice and mix it into our food without thinking twice. But did you know everyday table salt can also be used to clean your house? It’s naturally antibacterial and a strong abrasive that can be used to whip every inch of your home into sparkling perfection. Grab your salt shaker, and try out one of these hacks on cleaning day. One of the best ways to use salt is to clean inside your sink drains. “Mix salt with hot water and pour it down your sink regularly,” says Caleb Backe, a health and wellness expert for Maple Holistics, a company dedicated to natural products. 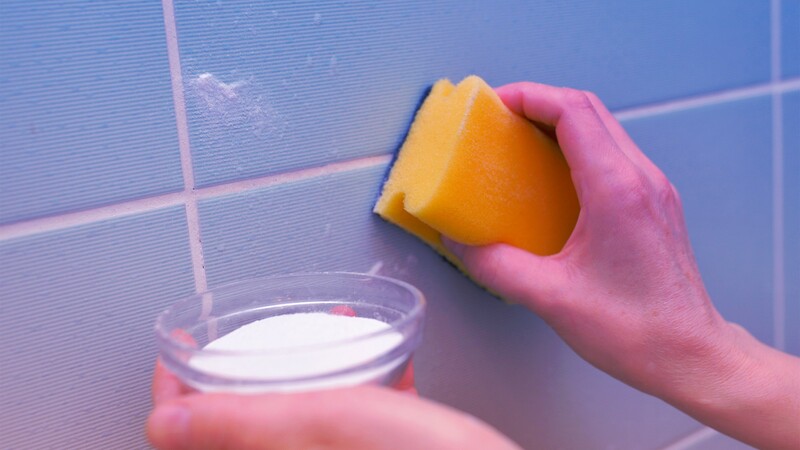 Doing this deodorizes the drain and helps keep grease from building up. Salt is an exceptional stain remover, says Greg Shepard, founder and CEO of Emily’s Maids home cleaning service in Dallas. Then pour a good amount of salt on the area. Rub the fabric and salt together. Place the stained item outside in the sun for a few hours, and then wash the fabric as you normally would. First, blot the carpet stain with a paper towel to soak up as much moisture as you can. Then, pour a generous amount of salt on it to keep the stain from setting and to absorb any remaining moisture. After a few minutes, vacuum up the salt. Finally, apply a solution of equals parts dishwashing liquid, vinegar, and warm water to the stain. Alternate between dabbing on the cleaning solution and blotting it dry. Cast-iron cookware is wonderful for searing steaks and frying chicken. But since washing it with soap ruins the finish, getting off bits of food can be a challenge. Salt to the rescue! After cooking, let the cast-iron skillet cool. Then, sprinkle it with table salt and scrub clean with paper towels, says Kait Schulhof of the website A Clean Bee dedicated to all things cleaning-related. This method cleans the cookware and adds an extra layer of seasoning. Cutting boards get a lot of wear and tear. To remove stains from the wood’s surface and give it new life, just use salt and lemon. Rinse with warm water, and use a cloth to dry. Stains can easily build up in hard-to-clean coffee pots. Tackle the problem by adding 3 teaspoons of salt, a cup of crushed ice, and a splash of water to your pot. “Gently swirl it around until the stains lift,” says Marcos Franco from Atlanta’s Mighty Clean Home. Salt can remove water rings on wooden tables and countertops, Franco says. Simply combine a few drops of vegetable oil and salt, then rub the mixture on the ring. Wipe dry with a cloth, and use Windex to remove any excess oil. To create a powerfully effective and affordable cleaning paste for your oven, you’ll need equal parts table salt, liquid dish soap, and baking soda. “Mix all the ingredients together in a jar to create a paste that looks like cake frosting,” says Jack Prenter, who runs ChoreBliss, a professional house cleaning company in Toronto. Then, put the mixture on a sponge and scrub the oven. After applying, leave overnight. The next morning, wipe the solution off with a damp cloth or sponge. Polish up your glass shower door with salt and grapefruit, says Brad Roberson, president of Glass Doctor, a window repair company. Just cut the grapefruit in half, dip one half in salt and scrub away. The abrasive salt and the acidity of the grapefruit eat away soap scum and mineral buildup, keeping your shower doors shining. Bonus tip: Add some grapefruit juice to the shower doors after cleaning to keep them spotless longer. When dealing with food-related cleaning, Alberto Navarrete, general manager of Frisco Maids in Dallas, prefers to take a natural approach. “You don’t want chemicals close to food, so salt is the answer,” he says. Use a mixture of equals parts salt and white vinegar (or club soda) to clean your refrigerator surface and remove any bad smells.